There are three ways you can use a taxi: Get on a taxi from a taxi stand located at stations, airports, or sightseeing spots, call the taxi company to ask for one, and stop a taxi (without any passenger) running on the road by raising your hand. If a taxi is not carrying any passenger, the sign "empty" will be indicated in red on the sign board set up on the dashboard. At nighttime, taxis in Tokyo turn on their lamps placed on top of the vehicles when empty. However, this may not be the case in other cities since the drivers turn them on at all times. Since the door on the left side in the backseat of a taxi will open and close automatically, you do not need to touch it if you are using that door. Recently, taxis are becoming non smoking in many regions. However, other than such places, there still are many taxi companies allowing passengers to smoke. There are two types of taxis: small-sized and medium-sized. The latter is a little bit more expensive than the former. 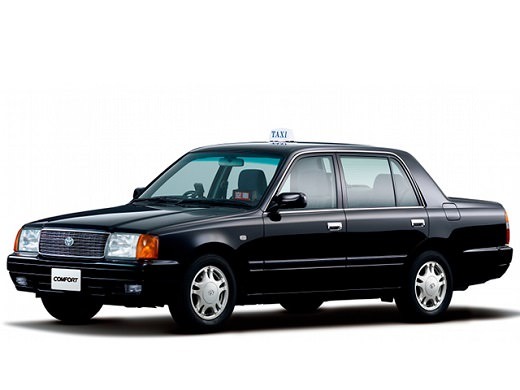 While the majority of the taxis are small-sized in many of the cities, mostly medium-sized ones are found in Tokyo. As for the fare, it is calculated by adding a certain amount to the base fare (starting fare) according to the distance traveled and time. During late hours (10:00pm - 5:00am), it is increased by approximately 20%. In some cases, the fares may vary depending on the region or company such as not charging any fee for pickup, setting the base fare at a low price, and not increasing the late hour fee too much. Credit cards can be used on taxis that have stickers indicating that they are accepted. Although some passengers choose to give away their change to the drivers, tipping is basically not necessary.